In addition to the two famous speakers, the event also offers fans the opportunity to meet the 2015 Penguins baseball squad, enjoy a breakfast buffet and bid on an impressive lineup of autographed Major League Baseball memorabilia and YSU baseball gear. Bench, who many consider to be the greatest catcher in MLB history, a two-time National League Most Valuable Player, a 14-time all-star and a two-time World Series champion. He was inducted into the Baseball Hall of Fame in 1989 in his first year of eligibility and has his number retired by the Reds.Today Bench is a popular inspirational and motivational speaker. Tressel first came to Youngstown in 1986 as the head football coach and went on to lead the Penguins to 10 playoff appearances and four national championships. He went on to lead Ohio State to the 2002 national championship and six Big Ten titles as head coach of the Buckeyes. 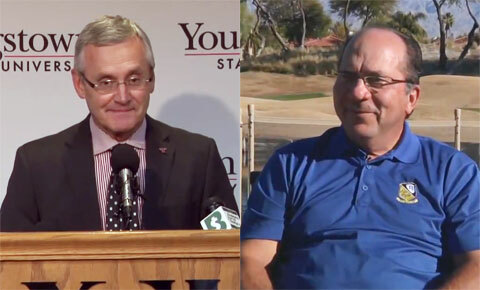 on July 1, 2014, Tressel became the ninth president of Youngstown State University. Playing Field Promotions is a booking agent for motivational sports speakers and celebrities. If you would like to book Johnny Bench for a speaking engagement or personal appearance, contact Johnny Bench’s booking agent for appearance & speaker fees at 1.800.966.1380.